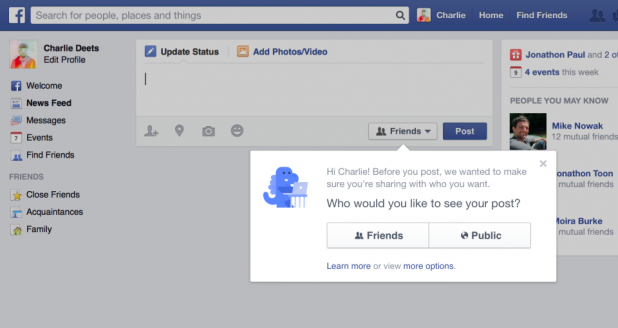 Facebook announced an enhanced privacy check for users. This check mainly emphasizes on member security concerns. Facebook will be rolling out a new and enhanced privacy checkup tool which will help users to review who they are posting to. It will also let users know the apps they use and the privacy of key pieces of information on their profiles. The largest social network has enhanced security for Facebook new users as well as old users. If a person joins the network, the default audience setting of his or her first post will be Friends rather than Public as it was in the past. All the new users can change that if they want. A reminder will be given to those users to choose an audience for their first post. The default setting "Shared Within Friends" will be enabled if they don't opt for any choice. But the advantage here is that users can change their audience at any time on present and past posts if they want.